Use the Privateer 2 Unofficial Patch to remove FMV interlacing and improve stability. DOS (original) or Windows (Deluxe). The Version 17.0e (Buffalo Wings) patch updates the DOS version with fixes and improvements. The GOG.com and Windows versions are already patched. The Privateer 2 Unofficial Patch removes video interlacing and fixes many other issues. 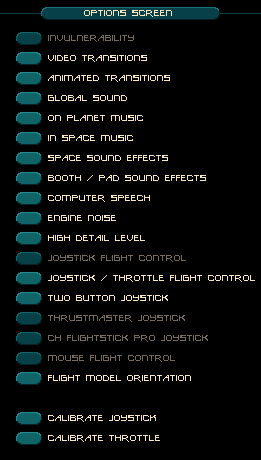 Download the Privateer 2 Unofficial Patch. Extract into the installation folder. Right-click DARKFIX.EXE in the installation folder and choose Properties. Click Compatibility and select the Run in Compatibility Mode check box. Select Windows 95. If you are using an original CD version you need to copy the files from all three CDs into the installation folder. Use DARKFIX.EXE to run the game from now on. Settings for the Privateer 2 Unofficial Patch are stored in <path-to-game>\DARK.FIX. 640x480 only. Use the Privateer 2 Unofficial Patch for pillarboxed. True for DOS version (when using DOSBox), false for Windows version. Toggle Flight Model Orientation in in-flight options (Alt+O). The Windows version only plays music when running in compatibility mode. 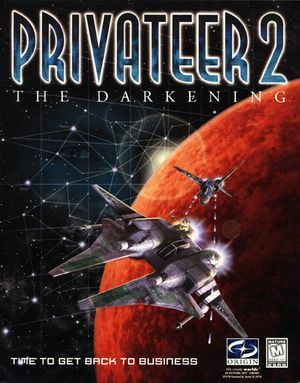 Install the Privateer 2 Unofficial Patch.